If Lupita Nyong’o and Saoirse Ronan star in something — especially together — we want to see it. Unfortunately, as far as we know, there aren’t any films in the works that will feature both award-winning actors. There is, however, a new ad campaign in which they costar, and even more exciting: It’s for a new fragrance, Calvin Klein Women. The print campaign features beautiful portraits of Nyong’o and Ronan in color alongside black-and-white photos of well-known women who have inspired them. Nyong’o’s headshot is positioned alongside artistically cropped photos of Eartha Kitt and Katharine Hepburn, while Ronan’s sits to the right of Sissy Spacek and Nina Simone. All of the images sit above that of the Calvin Klein Women bottle, a rectangular glass vessel with an oversized disc-shaped cap featuring an eye graphic and designed in collaboration with Raf Simons. In fact, this is the first Calvin Klein fragrance released since Simons took on the role of the brand’s chief creative officer. In addition to the print ads, Nyong’o and Ronan will appear in a TV campaign later this summer. Calvin Klein has also posted a video on its YouTube account of the two getting to know each other, and it’s basically the most adorable instant friendship ever caught on camera. Yes, queens. Focus Features released the trailer Wednesday for “Mary Queen of Scots,” starring Saoirse Ronan and Margot Robbie. The royal period drama features the pair of A-listers battling for the English throne amid complex family ties. Directed by Josie Rourke and set in the 1500s, “Mary Queen of Scots” is based on the true story of two ruling monarchs — and cousins — who both believe they are the rightful heirs to the English crown. Ronan plays the titular Scottish queen on a mission to overthrow the presiding English monarchy, while Robbie portrays Elizabeth I, fighting to maintain her spot on the English throne. Amid her attempted coup, Mary, Queen of Scots is sentenced to multiple years in prison and, eventually, execution. Produced by Tim Bevan, Eric Fellner, and Debra Hayward, “Mary Queen of Scots” will hit theaters Dec. 7. Greta Gerwig has chosen her next directing gig, and she is bringing along some of her Lady Bird talent. Gerwig will direct the feature adaptation of the Louisa May Alcott classic Little Women for Columbia Pictures. Saoirse Ronan and Timothee Chalamet, who both starred in Gerwig’s solo directorial debut, are in talks for the coming-of-age feature, along with Meryl Streep, Emma Stone and Florence Pugh. Little Women follows teenage sisters Amy, Jo, Beth and Meg and their mother in Civil War-era Massachusetts as they navigate first love and their first holiday without their father, a traveling minister. Alcott’s book was previously adapted into a 1994 feature, starring Winona Ryder, Christian Bale, Susan Sarandon and Kirsten Dunst. Gerwig was previously attached to the movie as a writer but has since taken over directorial duties, making Little Women Gerwig’s first major studio project since last year’s best picture nominee Lady Bird. Streep is set for the second season of Big Little Lies and will next be seen in theaters in Disney’s Mary Poppins Returns. Stone, Ronan and Chalamet are each leading upcoming award season hopefuls. Stone stars in Yorgos Lanthimos’ The Favourite, Ronan stars opposite Margot Robbie in Mary Queen of Scots and Chalamet leads the Amazon-backed Beautiful Boy. That first weekend in December is a prime launchpad for awards season fare, read that’s where Fox Searchlight launched its best picture winner The Shape of Water, and its best actress winner The Black Swan eight years ago. Directed by Josie Rourke, and written by House of Cards Beau Willimon, Mary Queen of Scotts explores the turbulent life of the charismatic Mary Stuart played by Saoirse Ronan. Queen of France at 16 and widowed at 18, Mary defies pressure to remarry. Instead, she returns to her native Scotland to reclaim her rightful throne. But Scotland and England fall under the rule of the compelling Elizabeth 1 (Margot Robbie). Each young Queen beholds her “sister” in fear and fascination. Rivals in power and in love, and female regents in a masculine world, the two must decide how to play the game of marriage versus independence. Determined to rule as much more than a figurehead, Mary asserts her claim to the English throne, threatening Elizabeth’s sovereignty. 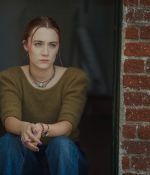 The newly released trailer for “The Seagull” features Saoirse Ronan, Elisabeth Moss, and Annette Bening in a lovestruck frenzy at their quiet country residence during the summer.